Riptide Elements®, a configurable LMS offering that delivers training content to any device in any language, was recognized by The Communicator Awards in Social Features Innovation for Mobile and Social Collaboration Community Building and Engagement. With over 6,000 entries received from across the US and around the world, the Communicator Awards is the largest and most competitive awards program honoring creative excellence for communications professionals. Elements uses xAPI and a Learning Record Store(LRS) to support social collaboration, gamification, learning goals, and profiles. Elements is helping clients in a non-disruptive way to realize the full potential of the enterprise training ecosystem either enhancing or replacing any existing legacy learning management systems (LMS). The Communicator Awards are judged and overseen by the Academy of Interactive and Visual Arts (AIVA), a 600+ member organization of leading professionals from various disciplines of the visual arts dedicated to embracing progress and the evolving nature of traditional and interactive media. Current AIVA membership represents a "Who's Who" of acclaimed media, advertising, and marketing firms including: AirType Studio, Condè Nast, Disney, Keller Crescent, Lockheed Martin, Monster.com, MTV, rabble+rouser, Time Inc., Tribal DDB, Yahoo!, and many others. “The work entered in the 22nd Annual Communicator Awards serves as a benchmark in gauging the innovative ideas and capabilities of communications and marketing professionals around the world. Each year, our entrants continue to amaze by reinventing the ways we communicate and market in an ever-changing industry.” noted Linda Day, executive director of the Academy Interactive and Visual Arts. The Riptide Learning Division brings Riptide Elements® learning products to the web/mobile international market. Elements is a flexible, scalable, and configurable platform of learning services (courseware, LRS, authoring, curriculum management, reporting & analytics, and hosting). Riptide staff members are active participants in the community developing xAPI—the benchmark in learner experience tracking. 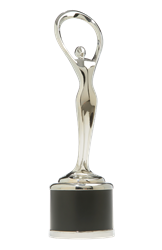 The Communicator Awards is the leading international awards program honoring creative excellence for communication professionals. Founded by communication professionals over a decade ago, The Communicator Awards is an annual competition honoring the best in advertising, corporate communications, public relations and identity work for print, video, interactive and audio. This year’s Communicator Awards received thousands of entries from companies and agencies of all sizes, making it one of the largest awards of its kind in the world.